Comfrey is an allotment essential. 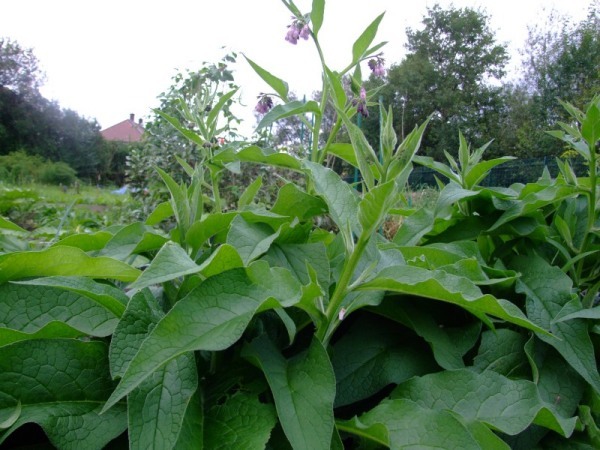 Comfrey – an allotment essential One plant I think every allotment should have is comfrey. It’s invaluable for making a rich plant feed. It’s easy to grow either from root cuttings, or if you don’t mind it spreading like mad – seeds! The roots sold are bocking 14 which is a sterile version. This is something to take notice of if you’re not very good at cropping plants. The seeded version is likely to spread but only if you allow it to flower! 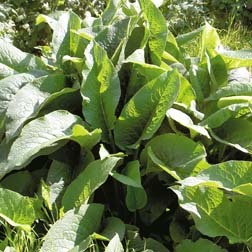 Comfrey can be cut several times a year once its established. Don’t cut it the first year though! Give it a chance to get established. Once people spot you’ve got comfrey they might ask for a piece. You can dig up a plant and separate out the roots. Only a small piece of root is needed to get going. In the first autumn wait til it’s died down and then tidy up the leaves. You can use the leaves to make a rich comfrey tea that will need diluting before putting on plants. You can compost the leaves in your compost bin, or lay them flat on the ground. I got good germination from the seeds in the greenhouse and potted them up until they were big enough to go out and the plants settled in well in a row on my allotment. The roots I potted up and grew on to start them off. I did find in the early weeks they were vulnerable to slugs. Comfrey isn’t normally eaten by slugs once it is big as it is quite furry and grows fast enough to cope with a few nibbles. I have a row of Bocking 14 and a row of normal seedy comfrey. I’m expecting to dig up at least one of the Bocking 14 to share with other plotholders this spring. I bought mine from Thompson and morgan – both the seeds and the roots. Roots – put roots in pots of compost in a sheltered space. Protect from excessive rain and slugs. When they’re growing leaves you can transfer them out to the position you want them in. They grow quite a bit in a season – lots of big leaves and a few foot tall! mine got to about 3 ft tall. I was tempted to crop them and use them but decided to give them a full season to grow. They’re quite happy to have muck thrown on them too – and will enjoy it! When I cut it this year I will wear gloves and use either hedge clippers of a pair of secateurs. The leaves feel quite strong and tearing them off might be bad for the plant. I’ve recently cut some slices off a plant for a friend to take to their allotment site. They got 8 pieces of root which should all grow. I’ve also dug up one of the seeding versions and potted that up to pass on to people who like flowers in their garden. I think comfrey is a great flowering plant that is well worth including and if it self-seeds and increases then that’s good too! I will keep an eye on the gardens the plants are going to and if they get overcrowded offer to go and sort out the ‘problem’ for them – and get myself additional plants to pass on. I’ve spotted most of my plants coming up but one in my front garden hasn’t reappeared yet so I’m not sure whats happened to that. So far this year the seeded stuff isn’t as bushy as the bocking 14 but it has already flowered. I’m going to leave one to seed so I can pass on additional plants to people – especially normal gardeners who might like a plant that will fill a corner of their garden with pretty flowers. My comfrey is starting to look like it’s ready for cutting back. 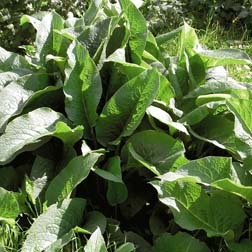 I’m going to collect up the leaves and get them into a container to make some comfrey tea!